Chapter 7 bankruptcy and Chapter 13 bankruptcy are wildly different. Not only is the filing process different, but the way that the bankruptcy discharges your debts is also different. In most cases, people prefer to file for Chapter 7. But there are some instances in which Chapter 13 is the preferred form of bankruptcy. In this article, we’ll discuss the differences, limitations, and qualifications that you will need to show in order to file for Chapter 7 vs. Chapter 13 bankruptcy. To learn more, contact a bankruptcy attorney at the Law Office of Eric Kornblum today. Chapter 7 is also known as liquidation bankruptcy. It’s so named for the manner in which it discharges your debts. The bankruptcy trustee who is assigned to your case will take a look at your investment holdings, your property, and other valuable assets in an attempt to liquidate what they can in order to repay your creditors. Each state allows you to protect a set number of assets and there are also federal rules on how much you can protect under the law. Typically, this is a dollar amount. More often than not, the bankruptcy trustee finds nothing to liquidate. Your debts are merely discharged and you are allowed to start over again without creditors harassing you. However, the penalties to your credit record are stiffer than they are if you file a Chapter 13 bankruptcy. Not everyone is allowed to discharge their debts in this manner. You must be able to prove that either: a) you make less money than the state median or b) you don’t have enough disposable income left over in order to pay the debts you owe. The latter is called the means test. Merely passing the means test is not enough to qualify for Chapter 7 bankruptcy. Occasionally, judges decide that even though a debtor passes the means test, they can still work out a repayment plan. This is something you will need to discuss with your bankruptcy attorney. Chapter 7 bankruptcy cannot discharge all kinds of debts. Some can only be discharged in Chapter 13. Namely, debts secured by real property. Secured debts, or those secured by some collateral, cannot be discharged in Chapter 7. These include debts like your car payment or a mortgage. Even if you are allowed to file a Chapter 7 bankruptcy, you will still owe this money and need to make payments to avoid having your car repossessed or your home go into foreclosure. Chapter 13 bankruptcy is also known as reorganization bankruptcy. You and your attorney submit a repayment plan to the court that makes sense and pays off as much as your debt as you can over a 5-year period. This repayment plan can discharge more of your debts than Chapter 7 can but it still cannot discharge all of your debts. It can, however, reorganize secured debts. Chapter 13 is more labor-intensive for your attorney as well, so it ends up costing more money. Instead of how much money you make, Chapter 13 bankruptcy has a limit on how much debt you owe. Currently, those limits are: $1,184,200 in secured debt and $394,725 in unsecured debt. Your attorney can over this question with you but typically, Chapter 13 makes the most sense for those who make too much money for Chapter 7 or most of the debt they owe is secured. Since Chapter 7 cannot manage unsecured debt, there’s little sense in filing for Chapter 7 if most of your debt is secured. While there are no limits on the amount of debt you owe to file for Chapter 7, Chapter 7 has limits on the amount of money you make or disposable income you have. Some people find themselves in the position of making too much money for Chapter 7 and having too much debt for Chapter 13. These folks will have to file for Chapter 11 which is even more expensive than Chapter 13. 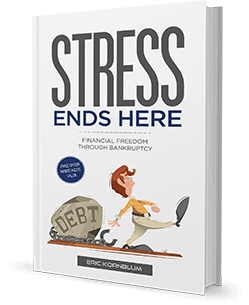 If you have questions concerning which form of bankruptcy makes sense for you, Chapter 7 vs. Chapter 13, the Law Office of Eric Kornblum is more than happy to help. Contact us today. « Can Bankruptcy Stop Foreclosure?